A. Wainscoting is usually a decorative panel or tile that covers the lower section of a wall. Common types of wainscoting are Raised Panels, Recessed Panels, Shaker Panels and Beadboard panels. Ceramic Tile is techincally also considered a wainscoting but most people would not classify it as tile. Q. What is difference between Raised Recessed and Shake Panels? A. All three have inner panels that are encased in between stiles and rails. Raised Panels have raised inner panels, Recessed Panels have flat inner panels and Shaker Panels also have flat inner panels with no fancy routs around the inner panels. 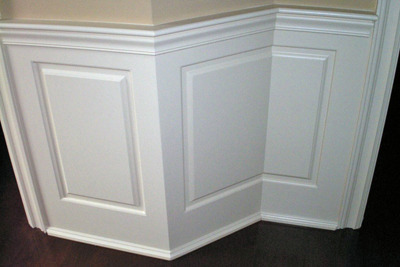 Here are some pictures that show various wainscoting panel types. A. Beadboard has vertically beades that are usually uniformilly spaced on 2 to 8 inches apart. Traditionally beadboard is made from thin boards that have tounge and groove joints or lap joints. Beadbaord can also be purchase in thin sheets but the sheet is really classified as a paneling and is more of an inexpensive product. Q. What are Stiles and Rails? A. Stiles are the vertical flat sections that separate the inner panels. The rails are horizontal and diagonal flat sections. See drawing below for details. Q. What are the Rails and Stiles defaults? A. The default stiles and rails widths and heights are in the following table. You can modify them as necessary in the design tool. Q. How thick are the Wainscoting Panels? Q. What is the smallest wainscoting panel width? A. The smallest raised panel width is 5". If you have a section less than 5" we recommend using a blank panel. You need to reduce the right and left stile widths to 1/2" to achieve a 5" wide panel. Q. What is the smallest wainscoting panel height? A. The smallest raised panel height is 6". If you have a section less than 6" high we recommend using a blank panel. You need to reduce the top and bottom rails to achieve a 6" high panel. A. MDF is Medium Density Fiber Board. 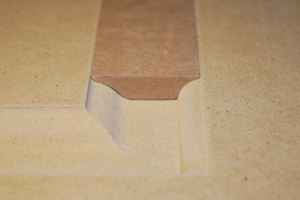 We use a Premium Plus MDF for all our panels which is ideal for intricate machining. 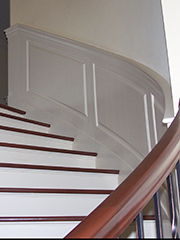 A. PVC is a plastic (Polyvinyl chloride) We use PVC for curved staircases, curved walls and exterior wainscoting panels. Q. Do you have an Installation Video? A. 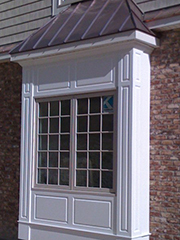 Yes we have a video that shows our guys installing wainscoting and Pediment Heads and Pilasters. The video is a work in progress because it does not have any audio, but it will provide a lot of good insight into the wainscoting installation process. Click to Wainscoting America Installation Video. Q. 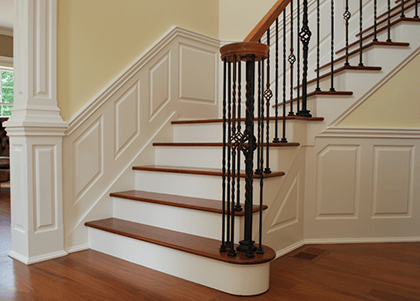 Can I install Raised and Shaker Panel Wainscoting on a staircase? A. Yes our web designer has multiple configurations available for staircases and stairwells. We also have a How To Measure a Staircase page that provides step by step measuring instructions. Q. Do I need to prime the surface before painting? A. Yes, you must prime all MDF surfaces. The best primer from a coverage perspective is Smart Prime by Zinsser which is a fast drying water-base primer. If you can not find the Smart Prime by Zinsser a second alternative is Kilz2 Latex Primer which is featured in our Priming & Painting Video. Once the surface has been sealed with a primer it will be necessary to lightly sand any raised fibers in the rout before painting. Q. Is Oil Paint Better Than Latex Paint for Trim and Wainscoting? A. Old timers will tell you that Oil Paints is better than Waterborne Paints because it is more durable and will lay better (less brush lines). Paint Technology has changes dramtically in recent years and we believe the benefits of Waterborne Alkyd Paints out weigh the benefits of Oil Paints and we recommend using them. There are 3 cons to Oil Paints - they yellow over time, have high VOCs (Smell), and the clean up requires harsh chemicals. A good quality Latex Trim Paint will not yellow, is durable and will self level giving a great apperance that will last. Q. What Waterborne Alkyd Paint Do you Recommend? A. There are a number of very good trim paints on the market. We are always comparing paints to find the best one. Our favorite at this time is Advance Waterborne Interior Alkyd by Benjamin Moore. We like this paint because it covers well, does not drag and levels very well (minimizes brush marks). You can go with a satin or a semi-gloss paint sheen. The satin sheen will be more forgiving and will hide most imperfections from your nail heads and seams. Q. What Oil Paint Do you Recommend? A. There are a number of good quality oil paints on the market. Our favorite at this time is a high quality alkyd (oil) based or lacquer-based paint. 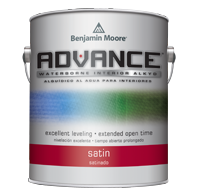 Benjamin Moore's Satin Impervo Finish Enamel Z235 is a premium quality, low lustre, alkyd enamel that is featured in our Priming & Painting Video. Q. Do I need to thin out the paint? A. This all depends on the type of paint that is used. If the paint is thick it may leave brush drag marks so you may need to add a paint additive. In our Priming & Painting Video we add Penetrol Oil Based Additive to the Satin Impervo Finish Enamel Z235 paint which will enhance penetration and adhesion and reduces brush marks. If you are using a latex paint check the label. Some manufactures recommend adding water and some will recommend using an additive such as Floetrol Latex Based Additive. Q. Do you recommend Semi-Gloss over Satin Paint Sheen? A. This really is a personal preference. If you are going to spray paint the panels Semi-Gloss is a good choice. If you are going to brush paint the panels then we recommend a Satin Finish. The Semi-Gloss Finish will show imperfections such as filled nail holes and seams if they where not prepped well but the Satin Finish will be more forgiving. Q. How do I contact Wainscoting America with design and order questions? Q. How should I store the Wainscot Panels, Pediment Heads & Pilasters and Top Cap if my room is not ready for installation? A. It is critical to store in a dry and low humidity location. Moisture and water can cause damage and will void our workmanship warranty. Q. Is there a warranty on the wainscot and pediment head / pilasters? A. We warranty our Wainscoting America panels against defects in material and workmanship for 3 years from date of shipment. Defects caused by improper storage, improper installation or improper finishing will not be covered by this warranty.